When her great-grandmother passes away, Harlow Jane Cassidy leaves her job as a Manhattan fashion designer and moves back to Bliss, Texas. But when she opens a dressmaking boutique in the turn-of-the-century farmhouse she inherited, Harlow senses an inexplicable "presence". Her old friend Josie orders a gown for her upcoming wedding, but when Josie's boss turns up dead, Harlow has to find the killer-with a little help from beyond. 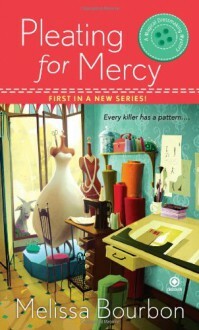 http://degreesofaffection.booklikes.com Degrees of Affection 4.5 Pleating for Mercy (Magical Dressmaking Mystery # 1) - Off to clear the library out! text Pleating for Mercy (Magical Dressmaking Mystery # 1) - Off to clear the library out! Another home run for a new series first outing!! This was just a fun, pleasant read on every level. A good story, good plotting, "real" characters and a great sense of place. I'll be looking for the next in this series for sure!